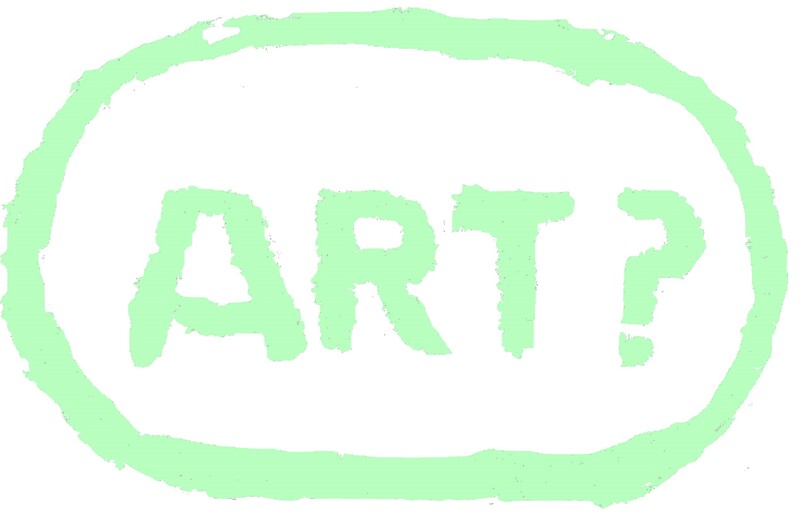 Review the project work that you’ve completed for this part of the course and then produce a drawing that needs a period of time to elapse during its production. Examples could be postcards sent to a friend, the outline of an expanding pregnant belly redrawn each month or a cyanotype image. Depending on what you choose to do, you may need to plan this carefully to allow yourself sufficient time to complete the piece within the time frame of the course, before your intended assessment date, etc. At the beginning of this stage of the course I read the brief for the Assignment and thought I would like to produce some sort of time lapse. This would possibly work best as a video so to test out the premise I began a small project which ran along with the coursework as I completed it. I planted a couple of hundred cress seeds to grown in a pattern, much like the window sill novelty “potato heads” planted with grass. The cress growing ran for two months and on each of the 60 days I took a photo of it as it progressed. After about day 50 I had enough of the whole project and stopped watering it and took photos each day as it at first slowly and then rapidly declined. To document it I used the daily photos to make a short video, essentially a time lapse of the cress planted, growing and dying back. This project was useful in preparing me for what I was doing for the project Assignment final piece. Not having used the video program I was to use the cress project was useful as a learning tool. This project is detailed below as a collection of still photos and a link to the 1 minute video on Youtube. Cress – Plant a seed! As a bit of fun art and to link with working in the environment, I thought I would create a mini-environment for myself. From planting there are daily photos to show how this develops over the next three weeks. Then aside from watering all I had to do was take a photo each day from a similar position. These were strung together to make a short movie of the birth, life and death of cress. The video has been uploaded to YouTube and can be viewed via the following link https://youtu.be/B4sIIVyoE-o There is an embedded version of the video below which will play from this WordPress blog. In keeping with several pieces in the coursework especially in this section I wanted to do a piece that was deeply personal. To this end I choose to base this Assignment on my deseased father, Noel. He died a couple of years ago but was to all purposes absent before then as he was badly affected by Alzhiemers. This condition had robbed him of his lifes memories and eventually of day to day contact when he totally lost his vocabolary and all knowledge of everything includoing who we, his family were! The brief for this assignment is to produce a drawing that needs a period of time to elapse during its production. 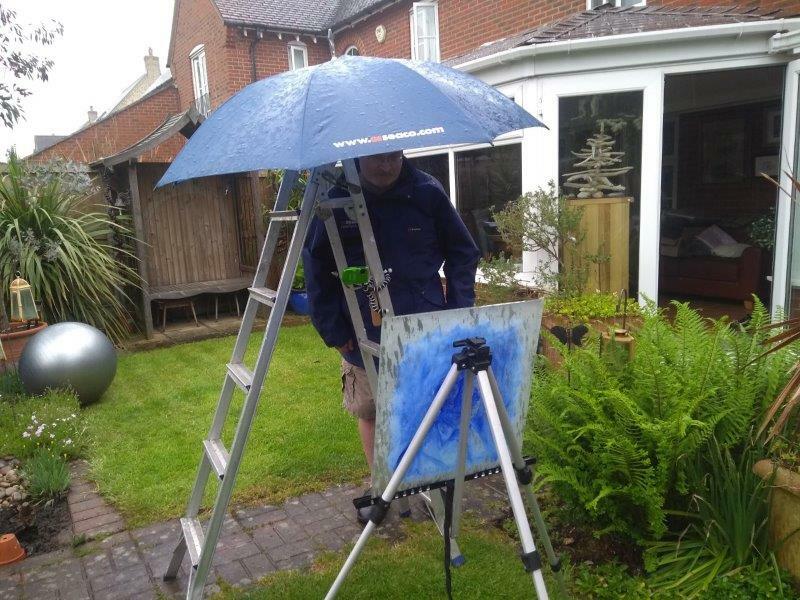 My setup to keep me semi-dry, the camera completely dry and the easel /glass portrait panel wet. 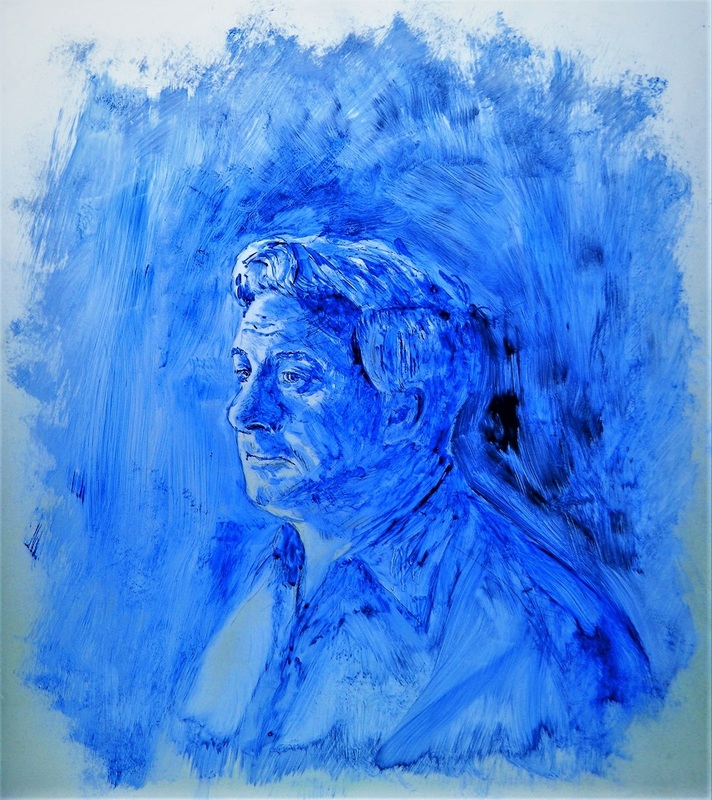 The concept behind this piece is to show using a video the effects of Alzheimers on the essence of a person. Over a period of a few years I was able to see my father turn from a bright garrorous man always talking and ready to joke to a frightened quiet individual unable to speak and unable to comprehend the complex bewildering world he found himself in. This piece like several in this section of the course were very personal pieces to me as the exercises were completed using my father as the subject. Having to watch him distintergrate over a couple of years due to Alzheimers was heartbreaking for all children (he did not have a surviving wife, our mother) and in truth this was a difficult and emotional piece to do. In this work I placed a portrait of my father painted in gouache outside in the rain and let this wash away much of the image. In a way the rain could also be symbolic of the tears and sorrow of his children watching him being slowly leached away. I had to have two goes at this as the first video did not work out as well as I had hoped. So, I re-painted the portrait and waited again for the rain to come, ensuring the faults of the initial piece were not repeated. 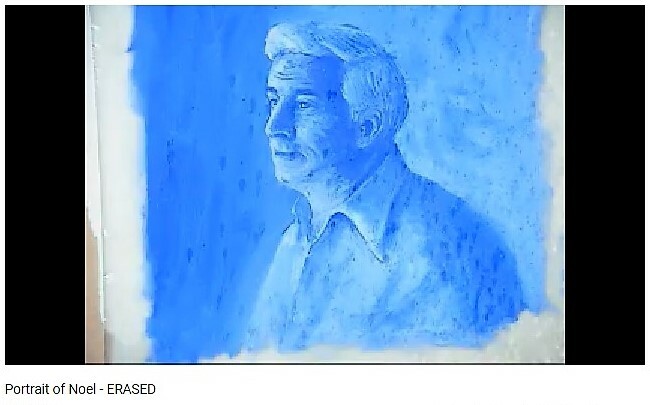 The above gouache portraits on glass measuring 40 x 45 cm, were used to make the videos of the erased / washed off portraits. 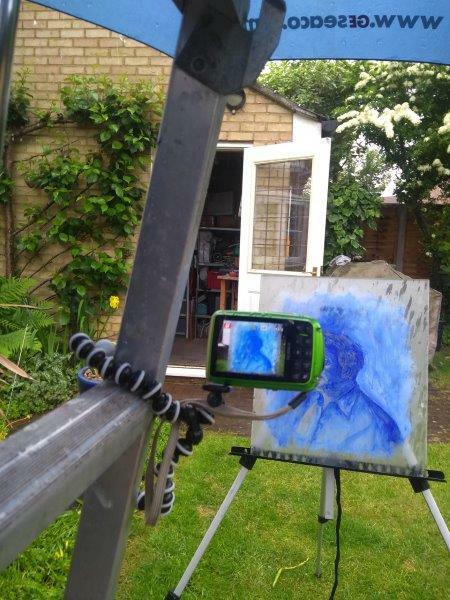 With version 1 I found that the video was not as good as I hoped with obvious bars from the easel supporting the glass and reflections from behind the camera being obvious and degrtading the image quality. With these issues in mind and with an aim to make a better piece that the first poor qulaity video I redid this piece. 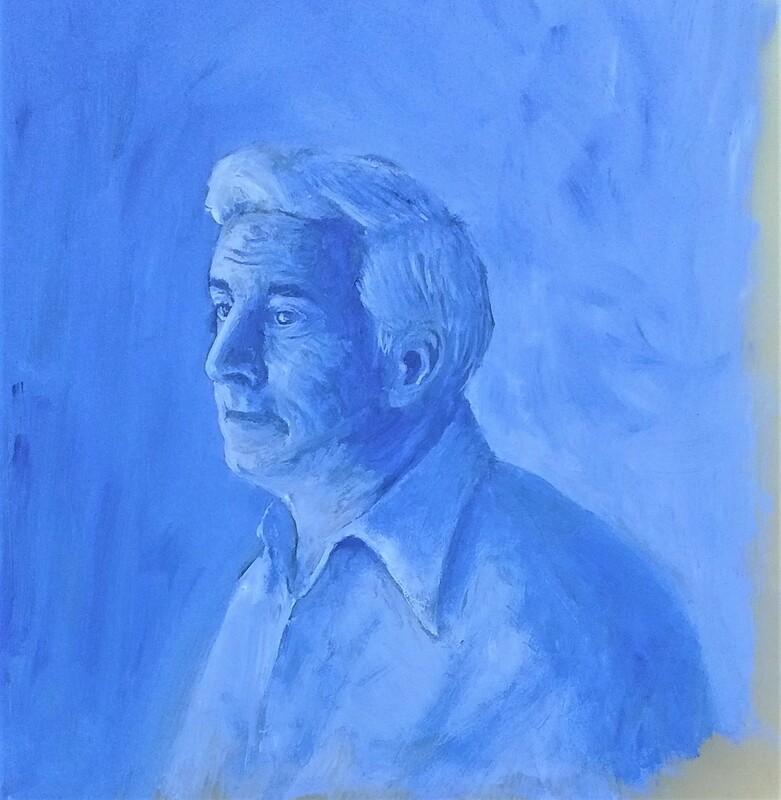 Using gouache more heavily in the second portrait I redid the portrait of my father. The above photograghs are of the portraits prior to the washing off / erasing process. The frosted glass became more transparent the wetter it became and the support bars of the bright aluminium easel became obvious and intrusive [these will be eliminated by having a sheet of paper behind the glass. The glass when it became wetter and showed the dark tones of the grass and background through the glass became in effect a mirror and the movement behind the camera intrusive to the image quality of the video. [the paper behind the glass and the heavier application of paint will make this less lightly. The application of paint was too light in the first portrait and thus some of the degrading washing off was not obvious. [heavier application of paint to remedy this. Background sounds from neighbours starting cars , opening and closing doors, revving engine and barking dogs all became distracting elements in the video. [the sound will be controlled to remedy this]. The rain was not falling on the sheet as much as expected due to it being too upright. This upright angle aids the flow of the washed off paint from the glass but reduced the amount of rain landing upon the glass. [I adjusted the glass angle halfway through the first video. A more shallow angle and a higher view/ camera position will allow for more rain to impact the target area i.e. glass sheet but a sufficient slope will remain to allow for the wet / washed of paint to sluice off]. A fully rendered portrait was painted in gouache upon a sheet of frosted glass (40 x 45 cm). This was then mounted outdoors and allowed to be partially / fully washed off. 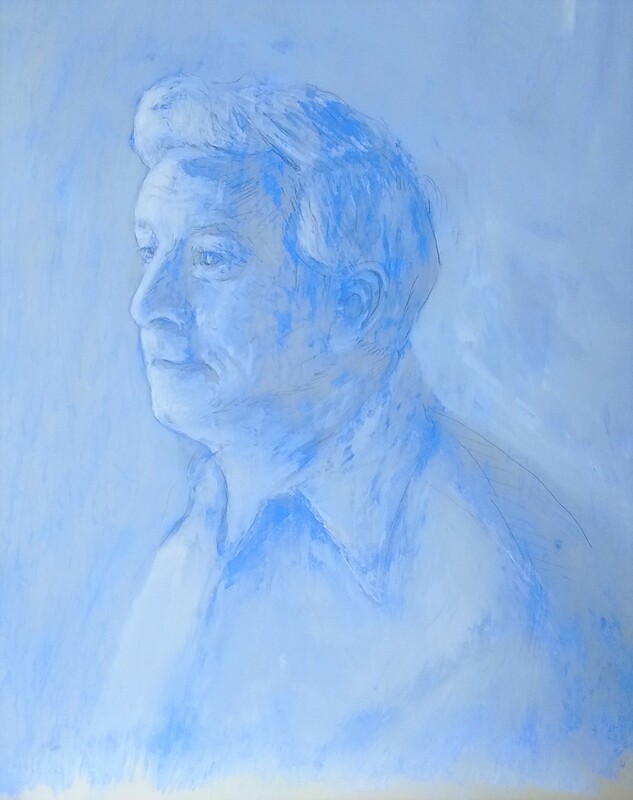 This erosion of the image and person depicted (my father) was to visualise the destruction of personality and a p[erson’s essence by the effects of Alzheimer’s. This process was video-ed and this video is the assignment piece, along with the final image of the degraded portrait. 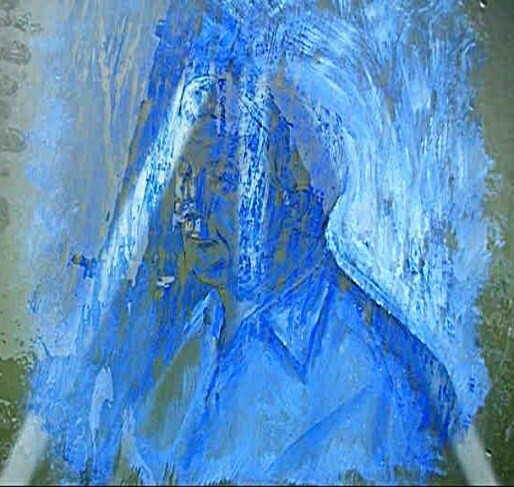 The video opens with a text introduction to the video, the video then continues with a still image of the portrait with it merging to a moving image as the rain falls and gradually degrades and disintegrates the portrait on glass. The video closes with a still of the partially erased portrait on glass. The speed of the video was adjusted to condense the erosion process to a quickly viewable time frame. The opening text in the video is noted below. My father Noel worked from the age of 16 until he was 82. Within a few months of retiring he was diagnosed with Alzheimer’s. Over the next couple of years we watched as his essence, his very being was stripped away. First he forgot names of objects, then people’s names and evetually his vocabulary was gone. The Noel we knew and loved was gone but there still existed a recognisable shell. To visually replicate in some way how Alzheimer’s and dementia affects people, eroding them away slowly and leaving a shell that is still recognisable without it being the person we knew, I have made a short video. 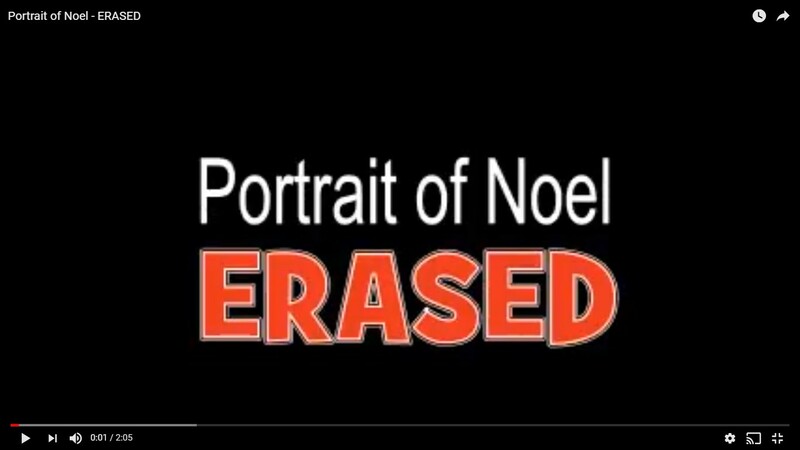 In this video we see a portrait of Noel painted on frosted glass in gouache being eroded by the rain. It is gradually reduced from a fully rendered portrait into a still recognisable but massively degraded shell of a portrait. The portrait ‘remains’ after the erosion process has been completed. The three videos relevant to this assignment can be found via the following link.